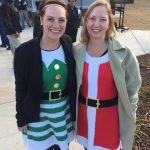 Santa’s Helpers: Danielle Hilderbrand, 2017 ABA President (left), and Ms. Kim (right). Ms. Kim is Acworth’s Citizen of the Year! 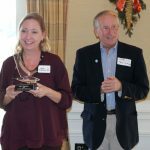 On Thursday, December 15, Ms. Kim was named Acworth’s Citizen of the Year by the Cobb County Chamber of Commerce during the Northwest Cobb Area Council’s luncheon at the Marietta Country Club in Kennesaw. “I am honored, as I’m honored to serve this community,” Wigington said after she was handed the award by Acworth Mayor Tommy Allegood, who nominated Ms. Kim for the honor.